We are excited to announce the launch of our new entry level and bariatric seating products. 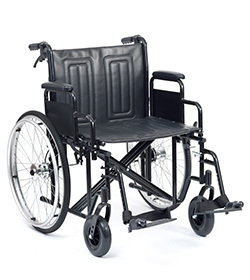 The new wheelchairs are designed to ensure that a larger person has the most comfortable mobility experience possible. As a result SOS now offer some of the most competitively priced entry level and bariatric wheelchairs in the UK. More information will be available on our website soon. Please contact us for purchase information. Available in 20” to 24” seat widths, the Sentra HD (Heavy Duty) is a collapsible Bariatric chair with a generous 31.5st (200kg) weight capacity. Featuring wipe clean padded vinyl upholstery for easy maintenance. The Sentra Heavy Duty is a versatile, low cost mobility solution. Footrests are made from aluminium for strength and are height adjustable and removable. Sentra HD Classic – with chrome finishes and self-propel wheels. Sentra Transit – With black finish and 12” rear wheels with solid tyres. The Sentra Bariatric is available in 26” to 30” inch seat widths with a 50st (318kg) maximum capacity. The sturdy steel frame and chip-resistant silver vein finish ensures that the chair is built to last. The seat itself is made from lightly padded nylon for comfort without compromising the chairs ability to fold for storage. The Sentra Steel transport chair offers a simple yet versatile mobility solution with up to 31.5st (200kg) capacity. 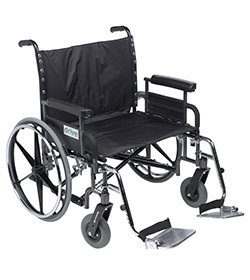 The transport chair is collapsible and features removable armrests for side transfer. 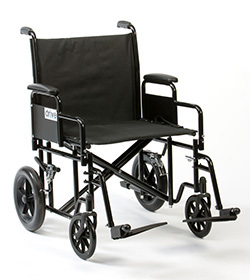 Combined with our smaller wheel option this chair is ideal for an attendant operated solution. Removable and reversible arm rests to aid side transfers. The HW2 is a robust and very sturdy Bariatric chair with additional comfort features. 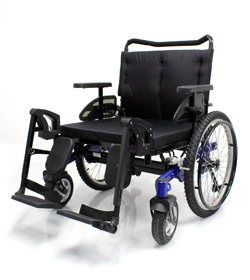 The HW2 features depth adjustment from 20” to 24” and backrest and seat angle adjustment. Available in 26” to 28” seat widths. The seat has a 46.5St (295kg) capacity.